The University of Michigan Museum of Art (UMMA) is a 93,000 square-foot facility located at the center of campus. 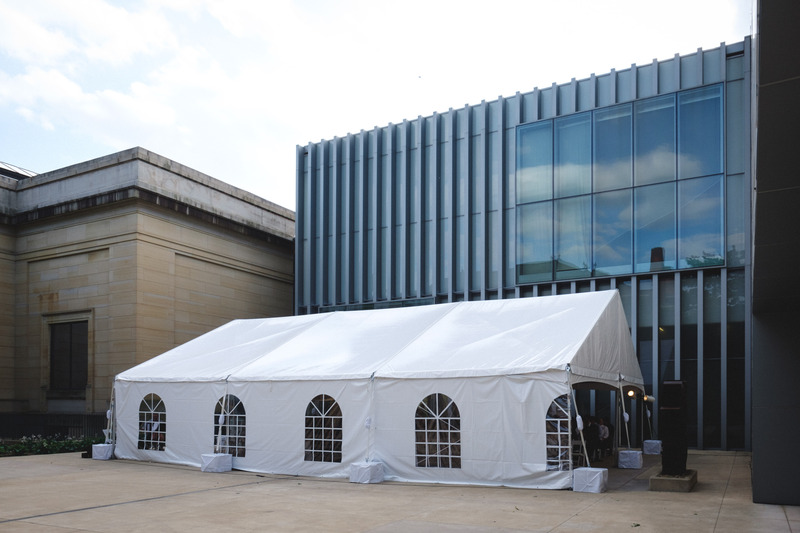 UMMA features a variety of both spacious and intimate event spaces for catered receptions, wedding ceremonies, entertainment, student events, multimedia presentations, corporate events and more. There are a number of diverse spaces available in the Museum’s Alumni Memorial Hall and the Maxine and Stuart Frankel and the Frankel Family Wing. UMMA’s spaces are available for events beginning no earlier than 5:30 pm on weekday and weekend evenings except Mondays. In addition, the Commons and Multi-Purpose Room are available during daytime hours. 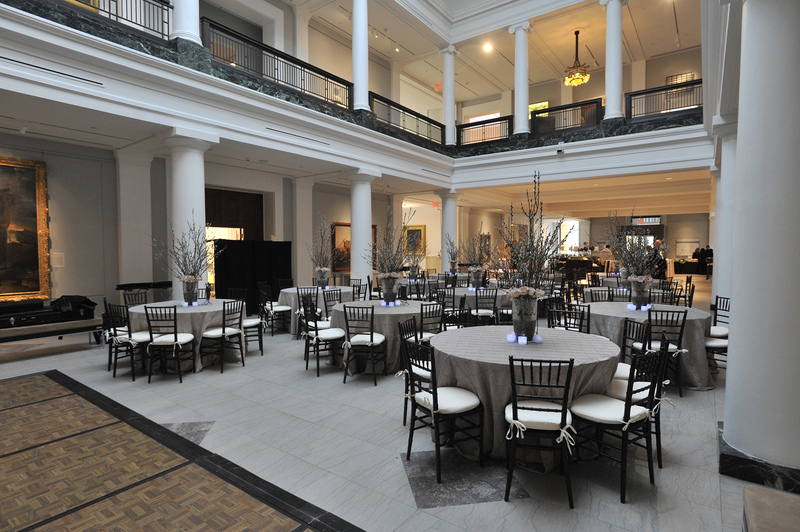 To ensure that you will be able to enjoy your special event at UMMA, we recommend making reservations well in advance. Please note: UMMA does not permit the use of its spaces for fundraising purposes. 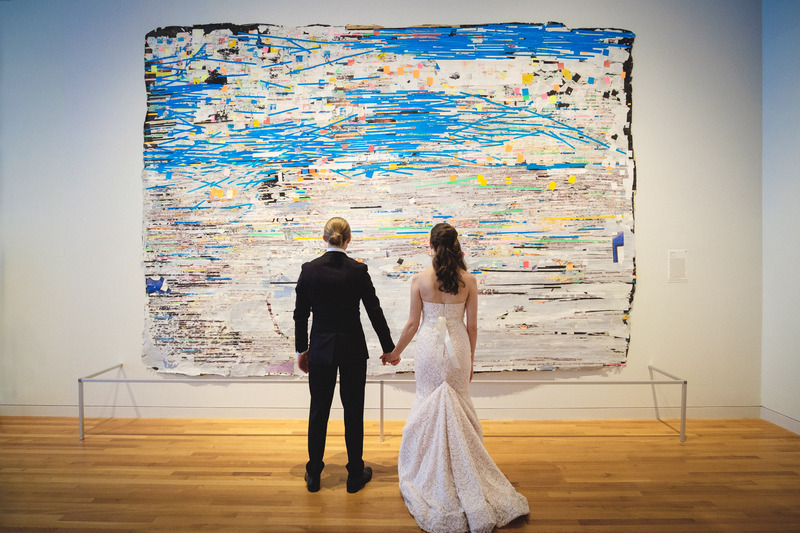 UMMA hosts upwards of twenty weddings a year for the most discerning of clients. The elegant sophistication of the Apse makes it an ideal location for a wedding ceremony, reception or other special celebration. 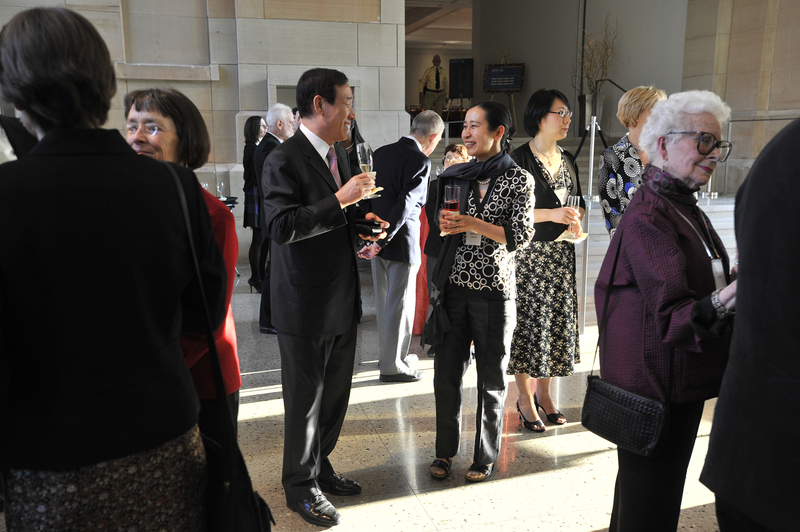 Housed in the Alumni Memorial Hall part of the building, guests are greeted by luxurious marble floors, a soaring 40-foot skylight, and works of art from our permanent collection. The Apse can accommodate 275 guests for dinner and up to 500 for a reception. For smaller events the modern sophistication of the Forum or Commons makes a lovely event space. 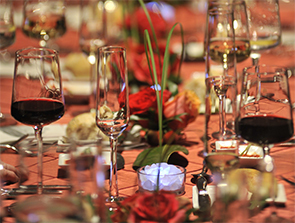 You can choose your own caterer from our list of approved caterers to create the perfect event for you and your guests. Galleries may be open for your event for a private viewing experience (additional charges may apply). Please fill out the events inquiry form for more details. UMMA’s grand architecture and variety of functional yet eye-catching spaces provide the perfect setting for corporate events. 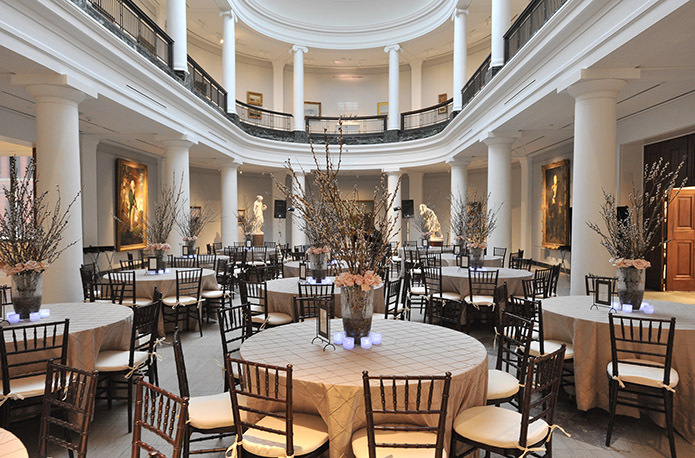 UMMA has reception and dinner spaces as well as meeting rooms and an Auditorium available to meet your corporate event needs. Please visit the Event Spaces section to find out more about our variety of event locations. Galleries may be open for your event for a private viewing experience (additional charges may apply). Please fill out the events inquiry form for more details. 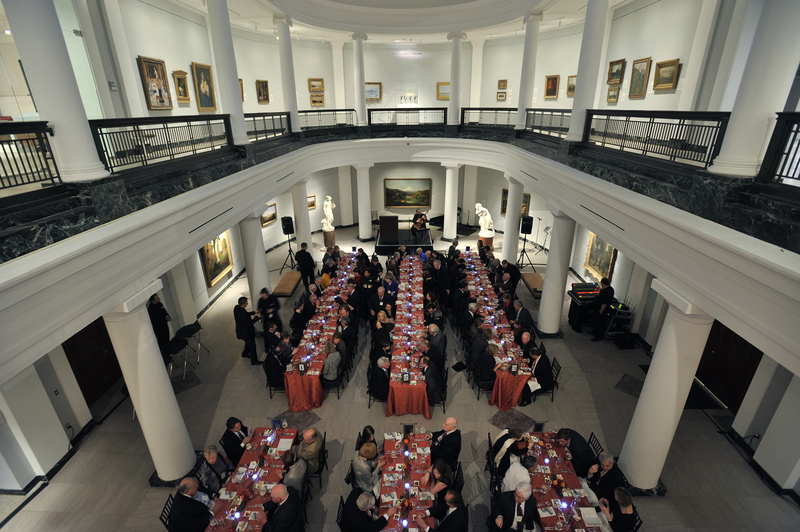 UMMA has event spaces to host dinners for 10 to 275 people and receptions for up to 500 people. Please visit the Event Spaces > section to find out more about our variety of event locations. 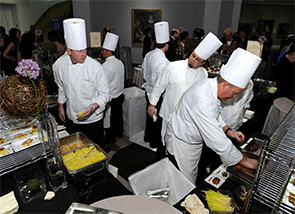 You can choose your own caterer from our list of approved caterers to create the perfect event for you and your guests. Galleries may be open for your event for a private viewing experience (additional charges may apply). Please fill out the events inquiry form for more details. Housed in the Maxine and Stuart Frankel and the Frankel Family Wing of the building the Multi-Purpose Room is a crisp, contemporary space great for private meetings. The Multi-Purpose Room comes with a media cart, which includes laptop and projector for no additional cost. Please fill out the events inquiry form for more details. If you are looking for a facility to hold a lecture, symposium, or film screening, UMMA's Helmut Stern Auditorium is both comfortable and beautiful. This space can accommodate 185 guests. Technical support must be provided by LSA-ISS for an additional charge. Please fill out the events inquiry form for more details. 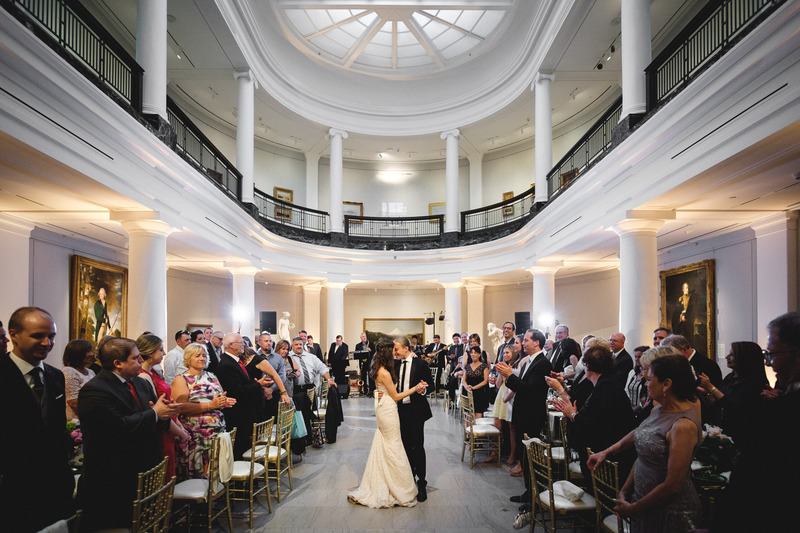 The elegant sophistication of the Apse makes it an ideal location for dancing, dinner, or a large reception. 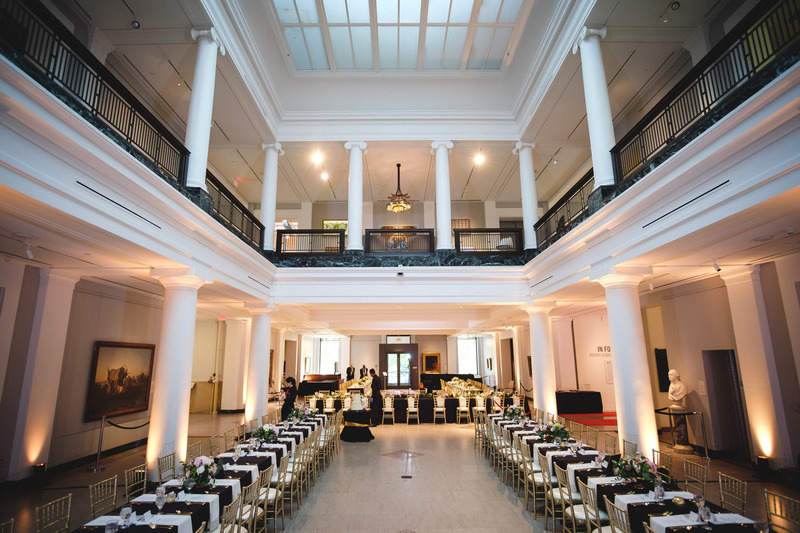 Housed in the Alumni Memorial Hall section of the building, guests are greeted by luxurious marble floors, a soaring 40-foot skylight, and works of art from our permanent collection. The Apse can accommodate 275 guests for seated dinners and up to 500 for standing receptions. 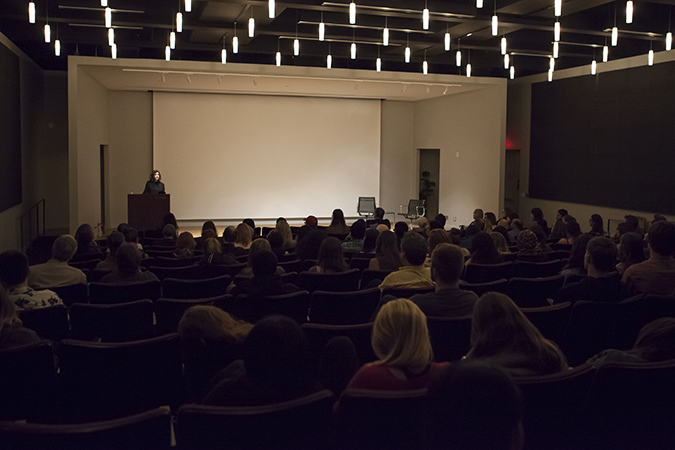 If you are looking for a facility to hold a performance, lecture, or symposium, UMMA's auditorium is both comfortable and beautiful. This space can accommodate 185 guests and can meet your A/V needs. Technical support must be provided by LSA-ISS. No food or drink is permitted in the auditorium. No admission may be charged for events in this space. They must be free to all attendees. Rental of this space requires A/V support from LSA-ISS with additional charges. For the smallest of groups, UMMA's Classroom is great for small lectures, forums or meetings. The room comes equipped with A/V capabilities, moveable tables and chairs, and a whiteboard. No food or drink is allowed in the Classroom and maximum capacity is 30. The Forum is a modern space with natural light and a wonderful space for events. It is located in the Frankel Family Wing adjacent to the Museum Store. The Forum can hold up to 100 guests for seated dinners and up to 175 guests for standing receptions. Housed in the Maxine and Stuart Frankel and the Frankel Family Wing of the building the Multi-Purpose Room is a crisp, contemporary space great for private meetings or intimate functions and can accommodate as many as 60 guests for seated dinners and 100 for standing receptions. UMMA's only rentable outdoor space serves as a nice accompaniment to our indoor spaces. Tappan Court can accommodate up to 250 guests for seated dinners and up to 350 for standing receptions. Requires the use of a tent. No alcohol is allowed. All events must be catered using a vender from UMMA’s list of approved caterers. UMMA has a strict policy regarding serving alcoholic beverages and must comply with all rules and regulations of the State of Michigan’s Liquor Control Commission. Only beer and wine are allowed. Call an UMMA representative at 734.615.2924.